Russian weapons manufacturers came in second in total annual revenues of the top 100 arms producing companies, bested only by the US, whose arms sales amounted to $209.7 billion in 2015, according to the Stockholm International Peace Research Institute. Global arms sales reached $370.7 billion in 2015, SIRPI reported on Monday, after tabulating the revenues of weapons manufacturers from the US, Western Europe, Russia, and beyond. The numbers come despite a downward trend over the past five years that saw a 0.6 percent fall in sales revenues from 2014 to 2015. America’s military industry had total arms sales amounting to $209.7 billion in 2015, down by 2.9 percent from 2014, according to a new study from the Stockholm International Peace Research Institute (SIPRI), the world’s leading think tank specializing in arms trade and disarmament. Despite the gigantic revenues, US companies’ arms sales were “constrained by caps on US military spending, delays in deliveries of major weapon systems and the strength of the US dollar, which has negatively affected export sales,” said Aude Fleurant, director of SIPRI’s Arms and Military Expenditure Program. Fleurant added that Lockheed Martin, the American global aerospace, defense, security and advanced technologies company, still remains the world’s largest arms manufacturer. The company is mostly known for its ambitious, yet extremely costly projects, including the development of F-22 Raptor and F-35 Lightning II fifth-generation fighter jets. Russia’s military industry came in second with combined arms sales from eleven companies reaching $30.1 billion last year, representing 8.1 percent of the revenue raked in by the top 100 arms producing companies in 2015, an increase of 6.2 percent from 2014. SIPRI senior researcher Siemon Wezeman said that most of the top Russian companies have profited from the government’s ongoing efforts to modernize the Russian military. 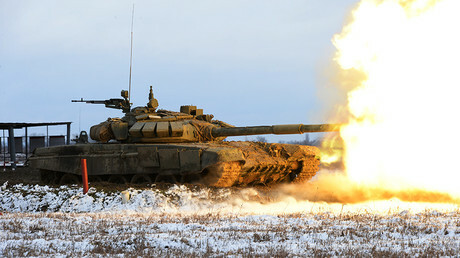 Throughout the past year, the Russian armed forces has received dozens of state-of-the-art armored vehicles, fighter jets, and combat helicopters, as well as a number of cutting-edge warships. Almaz-Antey, the country’s leading air defense systems manufacturer, United Aircraft Corporation, and United Shipbuilding Corporation, as well as Russian Helicopters, were named as Russia’s largest arms producers in terms of total sales. Six French companies, including Thales, Safran and DCNS, were listed in the top 100 with total revenue amounting to $21.4 billion in 2015, marking a 13.1 percent increase from 2014, when most of those companies’ sales fell to record lows.